In socialist countries, statues of the fathers of the Communist idea, Karl Marx and Friedrich Engels, were commonplace in most cities. Berlin was no exception, though unlike many former Communist cities, the pair are still standing (or in Marx’s case, sitting) downtown today. The larger-than-life statues of Marx and Engels, co-authors of The Communist Manifesto, were unveiled in 1986. Behind the statues is a relief wall showing scenes from the history of the German socialist movement. 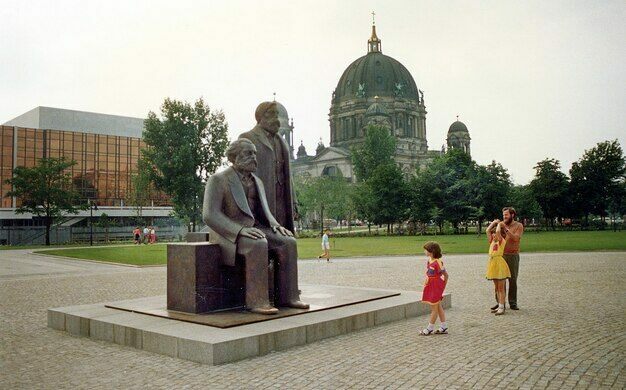 Before World War II, the area now occupied by the statue was a densely populated Old Town quarter between the river and the Alexanderplatz public central square. Allied bombing razed the area, and when the ruins were cleared after the war nothing was built to replace them for years until the statue was erected. Since German reunification in 1990, however, the statue has been the subject of public controversy. Some feel it is an unwanted relic of a regime they oppose, whereas others believe the site has artistic and cultural significance. For now, the latter has prevailed. The Marx and Engels Forum was once set against the backdrop of the (now demolished) Palast der Republik, the former seat of parliament for the German Democratic Republic (GDR), or East Germany. However, construction for an extension of the U5 U-Bahn line meant that the monument was moved to a shady corner a few hundred meters away, rather than right in the centre of the square. During this relocation, the statue was also turned (symbolically?) by 180 degrees, now set facing away from Alexanderplatz and towards the former West Berlin. It is located just across the street from the city’s GDR Museum.